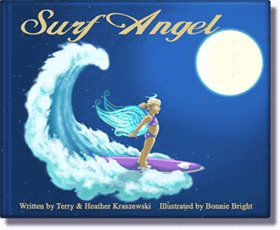 "Surf Angel" is a delightful book about the young and playful Surf Angel, who ensures a safe night’s sleep to all of her ocean friends, and brings children closer to the magical wonders of the sea. Included with each book is an audio CD, lovingly narrated by Surfing Legend, Kathy Kohner Zuckerman, The Original Gidget, who is accompanied by the enchanting sounds of the ocean and its inhabitants. Authors Terry and Heather Kraszewski begin this bed time story with children getting ready for bed. The playful verse takes off into an imaginary world where a young child and sea life interact. Once everyone is tucked in for the night, Surf Angel will beckon to your child, "Surf your dreams!" As she returns to her heavenly lookout in the skies above.